farming in Dir and Bajaur Agency. 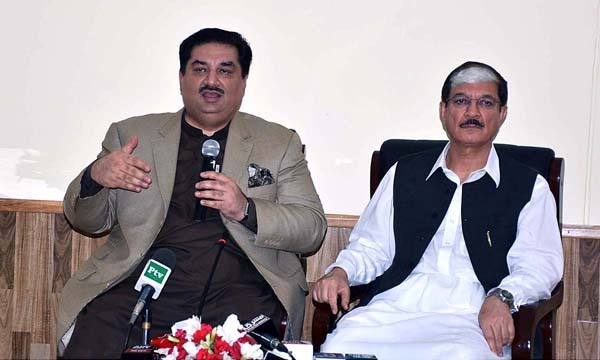 This was said by Federal Minister for Commerce and Trade, Engr Khurram Dastagir while speaking at a ceremony held here on Wednesday at Pakistan Tobacco Board (PTB). employees of the Pakistan Tobacco Board. Pakistan a developed country and bring it among the group of prosperous countries. tobacco, government has decided to give grant of Rs. 100,000 to students doing research on the crop. minds whose research and hard work will soon make the country as `Asian Tiger”. Khurram Dastagir said before 2013, the whole country was passing through a very difficult juncture due to terrorism. We have reached to this stage after a lot of hard work and sacrifices of our security forces and countrymen, he added. He said due to courageous leadership of Prime Minister, Nawaz Sharif who took hard stance against terrorists, today we have living in peaceful atmosphere. Sharif that countrymen have got rid of the menace of terrorism, Khurram remarked. announced a raise of 40 percent in salaries of grade one to four employees. Similarly, raise of 45 percent in salary of employees in Grade five to ten. Those working in Grade 10 to 15 got a raise of 50 percent in their salaries. He expressed the hope that employees of Pakistan Tobacco Board will work hard for making the institution best and for benefiting the farming community of the country. Pakhtunkhwa and those associated with this industry. tax net to get themselves registered and work under country’s rules and regulations.